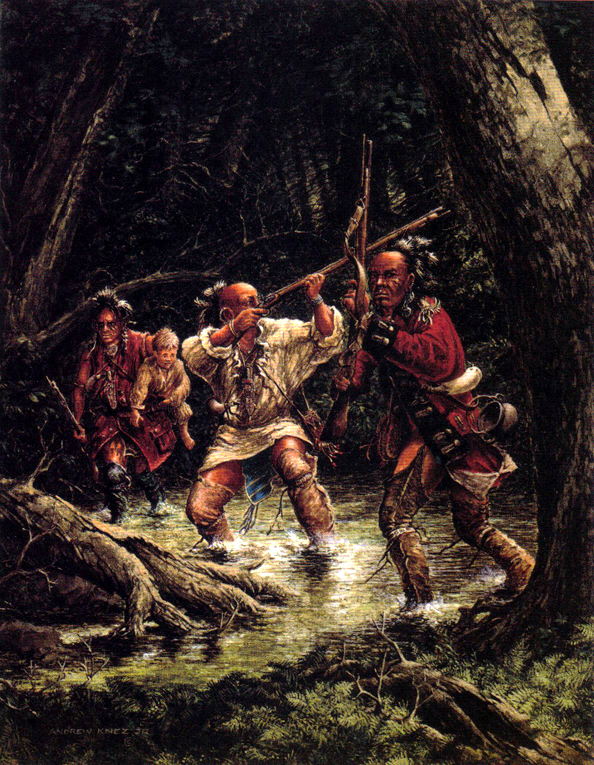 "The Abduction of John Tanner"
In 1789, at nine years of age, while collecting walnuts in disobedience of his father's instruc­tions, John Tanner was captured by a group of Shawnee warriors near the mouth of the Great Miami River. The purpose of the capture was to find a replacement child for the wife of the leader of the raiders who had recently lost her son. After many days of difficult travel they reached the village where Tanner was adopted as the replacement son and named Shaw-shaw-wa-be-na-se (The Falcon). He was protected somewhat by his new mother but was treated very harshly by his abductor. Once, he was tomahawked and almost killed for falling asleep while he was supposed to be working. For two years he survived much abuse and starvation until he was eventually sold for two kegs of whiskey, blankets, tobacco and other miscellaneous items to an important, older Ottawa woman who had recently lost her own son. Her husband was an Ojibbeway and seventeen years her junior. They were very kind and indulgent to Tanner and always referred to him as their son. John Tanner learned the Indian way of life, grew to manhood, married twice, had children and survived numerous attempts on his life. He always entertained the thought of returning to white society. He did return in later years, found some relatives, but couldn't adapt to their culture and eventually returned to his Ojibbeway lifestyle. The painting depicts an event that occurred four days after Tanner was captured. They had traveled north into the Ohio county, when, after crossing a deep river, he discovered some turkey eggs that he turned over to his captors. As they were preparing to boil the eggs in a small kettle, they became aware that their pursuers were close at hand and they hurried to escape with their "new son".